A plant often used in folk medicine—does it have real effects on health? Goldenrod (also known as solidago canadensis or solidago virgaurea) is a flowering plant used as an herbal supplement that has long been used in folk medicine. The above-ground parts of the plant are believed to have medicinal value. In nature, goldenrod can crossbreed with other plants. The United States is home to more than 130 distinct species of the plant. Goldenrod is also native to Europe and has spread to most of the world. Goldenrod gets its name from its small clusters of yellow flowers, which usually bloom in August and September. Some varieties have jagged-edged leaves while others have smooth edges. In traditional medicine, a wide number of benefits have been attributed to goldenrod. However, there is currently no scientific evidence to support many of these uses. Not all scientific evidence is definitive. While we do have some early evidence for goldenrod's use in certain health problems, most of the research we have so far is limited to test tube and animal studies. That means we can't make strong claims about its safety and effectiveness for human use. In Europe, goldenrod is frequently used to treat urinary tract inflammation and to prevent or treat kidney stones. However, evidence for these uses is primarily anecdotal. A 2009 study published in the Journal of Ethnopharmacology demonstrated anti-inflammatory effects of a goldenrod variety called solidago chilensis meyen. Researchers say it worked both topically and systemically. They theorize that changes in leukocyte-endothelial interactions were an important part of the mechanism of action. If further study supports its use as an anti-inflammatory, it could lend support to its use in arthritis and other inflammatory conditions as well as hemorrhoids and other topical uses. Some older, preliminary studies also suggest that goldenrod may have anti-spasmodic effects, which means they may help alleviate muscle spasms. A 2009 study on plant extracts for killing certain infectious agents in animals suggested that goldenrod (solidago virgaurea and solidago graminifolia) helped animals infected with Acanthamoeba survive up to three times longer than those who weren't treated. The extracts were used both internally and externally and found to be effective in both forms. They also did not appear to be toxic. In a rare human study, Italian scientists published a paper in 2013 that looked at goldenrod and other herbal medicines along with antibiotics in people with urinary tract infections. One group took antibiotics alone while the other took a combined treatment of antibiotics and herbal medicines. The group on the combined treatment had fewer UTIs and a longer gap between recurrent infections than the group on antibiotics alone. A 2016 study also isolated and identified antibacterial and antimicrobial compounds in solidago virgaurea. Multiple older studies suggest a diuretic effect of goldenrod, but these studies are not supported by further research. Much of the support for this use comes from these older studies as well as anecdotal reports. Researchers have discovered that goldenrod contains polyphenols, which are plant-based chemicals that often act as antioxidants. Research does support the antioxidant activity of goldenrod, although some varieties may be more potent sources than others. Antioxidants clear free radicals from your system. Free radicals are the result of pollution, smoking, rancid food, and normal aging as well. They can damage your cells and contribute to a wide variety of diseases. Antioxidants may help alleviate inflammation, as well. So far, we're not aware of many potential side effects associated with goldenrod. The primary known side effect is heartburn. However, the low number of side effects doesn't mean this herb is safe for everyone to use. 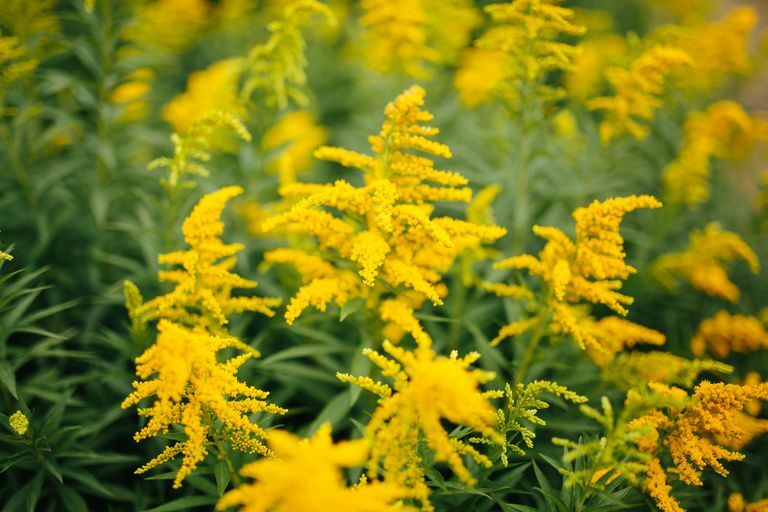 A possible concern with goldenrod is allergic reactions. If you have hay fever, talk to your doctor before taking it. However, it's common for people to confuse a ragweed allergy for a goldenrod allergy because these related plants bloom at the same time. A goldenrod allergy is actually much less common than a ragweed allergy. Both plants are in the aster family, which also includes, daisies, marigolds, artichokes, and many other plants. It's possible to be allergic to some members of this family and not to others. However, that doesn't mean it isn't possible to be allergic to goldenrod, whether or not you've ever experienced an allergic reaction to other plants in the aster family. Be sure to watch for an increase in hay fever symptoms if you start taking goldenrod medicinally. Natural substances such as goldenrod can have negative interactions with medications. Your doctor and pharmacist can help you identify any potential problems with the drugs you're taking. Many of the drugs listed above are diuretics, also known as water pills. That's because goldenrod may increase the effects of diuretics and flush too much fluid from your system, which increases your risk of becoming dehydrated. Other drugs may interact negatively with goldenrod as well. Be sure your health-care team is aware of everything you're taking, including natural products, and be alert to any unexpected changes in your health when you start taking something new. We don't have enough information on goldenrod's safety during pregnancy or breastfeeding to say what impact it could have on your baby. It's best to avoid goldenrod during this time. People with certain health conditions should avoid goldenrod due to potential complications that usage of the herb could cause. Fluid retention due to heart or kidney disease: People with this problem should not use goldenrod for "irrigation therapy," in which goldenrod is taken with a lot of fluids in order to increase urine output. High blood pressure (hypertension): It's possible that goldenrod may make your body accumulate excess sodium. Higher sodium levels in the body can make high blood pressure worse, so goldenrod isn't recommended for people with high blood pressure. Urinary tract infections: While goldenrod may be beneficial for use in certain kidney problems, and to help treat UTIs in conjunction with antibiotics, it's not believed to clear up an infection on its own. You should also talk to your doctor before using goldenrod if you have low blood pressure (hypotension) and/or osteoporosis. Because of the risk of dehydration, it's recommended that you drink at least two liters of water per day while you're taking goldenrod. The herb can be taken in any of several preparations. Measure 3 to 5 grams (1 or 2 teaspoons) of the dried herb. Heat 150 milliliters (ml) of water to boil. Steep for five to ten minutes. The usual dosage ranges from 6 to 12 grams per day, with equates to between two and four cups of tea per day. It's recommended to drink it between meals, not along with them. If you taking a liquid extract of goldenrod, the typical dosage ranges from .5 to two ml, two or three times per day. It's easy to forget that natural things such as goldenrod aren't necessarily safe and harmless. They can cause side effects, negative drug interactions, and allergies just like pharmaceuticals can. Be aware of what you're putting in your body, make decisions with input from your healthcare team, and pay attention to how new aspects of your treatment regimen make you feel. Tamura EK, Jimenez RS, Waismam K, et al. Inhibitory effects of Solidago chilensis Meyen hydroalcoholic extract on acute inflammation. Journal of ethnopharmacology. 2009 Apr 21;122(3):478-85. DOI: 10.1016/j.jep.2009.01.029. Wozniak D, Slusarczyk S, Domaradzki K, Drys A, Matkowski A. Comparison of polyphenol profile and antimutagenic and antioxidant activities in two species used as source of Solidanginis herba – goldenrod. Chimistry and biodiversity. 2018 Apr;15(4):e1800023. DOI:10.1002/cbdv.201800023. Frumenzio E, Maglia D, Salvini E, et al. Role of phytotherapy association with antibiotic prophylaxis in female patients with recurrent urinary tract infections. Archivio italiano di urologia, andrologia. 2013 Dec 31;85(4):197-9. DOI: 10.4081/aiua.2013.4.197. Derda M, Hadas E, Thiem B. Plant extracts as natural amoebicidal agents. Parasitology research. 2009 Feb;104(3):705-8. DOI: 10.1007/s00436-008-1277-9. Ca Hibiscus Tea Lower Your Blood Pressure, Sugar, and Cholesterol?